The latest addition to our fabulous shoe favor category is this very stylish shoe compact mirror. What woman wouldn't love to carry one in their purse? 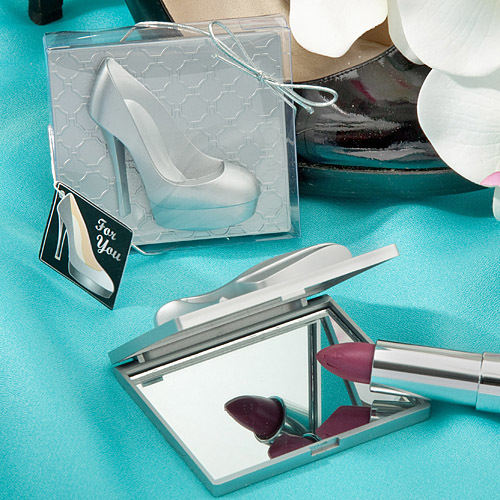 Each high heel compact measures 3" x 2.5". Rectangular compact case is made of silver matte finish hard molded plastic. Exterior has an ultra-stylish Hampton link and raised high heeled shoe design. Opens at a side hinge to reveal a dual glass mirror interior. Packaged in a clear box with a metallic silver ribbon wrap and bow and an attached matching high heel design "For You" tag.